Dixie and Louis in their “wading pond”. We have been using a small wading pond to let the ducklings get some exercise swimming around and diving below the surface. 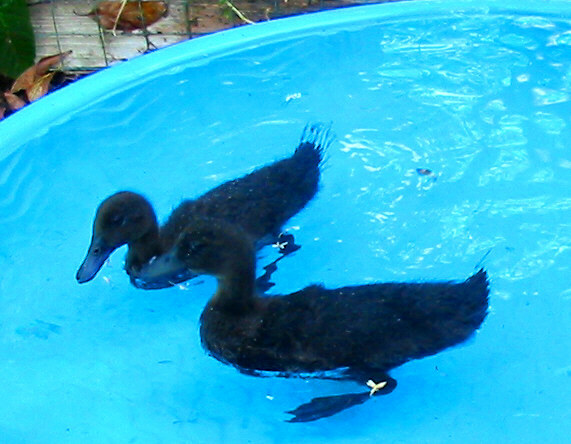 We plan to have a larger and drainable permanent pond for them by the time they are grown. The pond needs to be drainable for cleaning because they love to make Gawd-awful messes while playing in the water. Ideally, they should have a pond with circulating water that cleans itself, but that is a bit beyond our “duck budget” right now. Meanwhile, we are enjoying the ducklings and all their cute antics. This entry was posted in Pets and tagged cayuga ducks, duck pond, ducks. Bookmark the permalink.